There’s no doubt winter’s arrived in Tignes. 100 km/h winds closed the glacier for the day, so I made the most of the weather and tried my hand at cross country skiing. I’ve been interested in trying out Nordic skiing for a couple of years now, but only recently made the decision to buy the kit. I easily justified the e-bay purchase to myself, since the 230€ cost wasn’t a lot more than a season’s pass for the gym and swimming pool, it included skis, boots, bindings, poles, plus postage from Germany, and it could be enjoyed even when the ski lifts are closed. I’d done some research on basic classic skiing technique, and figured the diagonal ‘kick and glide’ couldn’t be that different to walking. How wrong I was! The flimsy nordic ski boot offers but a fraction of the support of a modern alpine boot, so even a bit of uneven terrain was enough to knock me off balance. Despite a few tumbles, I started to get the hang of snowplowing the descents, though I’m a mile of telemark turning. 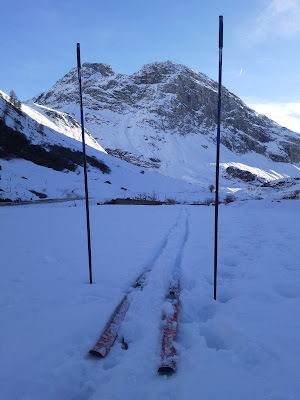 Excited by the snow and my first chance to use my skis, I ignored the fact that the snow at village level was only a few centimeters deep. I picked up a few scratches, but hey, I’m sure I’ll pick up a few more along the way. I plan to write a few more detailed reports on my newfound passion, but in the mean time, here’s a youtube clip of me in Tignes at 12pm today. This entry was posted in Nordic Skiing on November 3, 2009 by Rorie.